Collaborations between breweries and rock stars are ten-a-penny these days and most of them are worth little more but Ed Cosens out of Reverend and the Makers is better than that. Django is the fifth beer that the guitarist has produced with the Thornbridge team at Bakewell and one of the most adventurous beers that either have released to date. This time we're talking about a 4.5% thai pale ale flavoured with lemongrass and kaffir lime which is hopped with goldings. We missed the beer first time around, which is a shame, because Django (named in reference to Jazz-man-ledge Django Reinhardt, duh!) is a zesty number, ideal for sunshine supping; not quite the same in September on Derbyshire Lane in the Cross Scythes' beer garden but very drinkable nevertheless. Don't be deceived by the rather thin-looking body of this beer because there is plenty of that fresh, crisp Thai taste herein and the flavours balance really nicely. 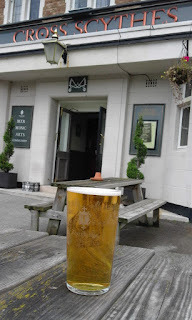 It does remind me of the Wild crowdfunding one I had at the Coach & Horses more than other Thai-flavoured ones like Elusive`s Tom Yam Wit: Django is quaffable, moreish, not a `one and done` type of ale. I hope Thornbridge consider adding this one to their impressive range of bottled wares. What was your first drinking experience? ABOUT 9 or 10 I USED TO HAVE A CHEEKY SWIG OF MY DADS CAN OF STONES WHILST HE WAS GARDENING! FIRST PROPER DRINKING EXP. WAS A NEW YEARS EVE PARTY AT MY PARENTS HOUSE AT ABOUT 14 WHEN ME AND A MATE SNUCK IN A 1/4 BOTTLE OF VODKA AND ORANGE JUICE TO MY BEDROOM. NEEDLESS TO SAY IT DIDN'T END WELL!! RED. WITH A REALLY GOOD STILTON! A QUALITY RUM, APPLETON ESTATE OR AN AGED HAVANA. LOVE A NICE AMARETTO ON ICE NIGHTCAP. Is thai food your err, tipple then? I LOVE THAI FOOD. ITS SO FRESH AND HEALTHY TASTING. THE FOOD WE HAD IN THAILAND WHEN RECORDING THE NEW REVEREND AND THE MAKERS ALBUM WAS NEXT LEVEL. FRESHLY PREPARED EACH DAY BY A CHEF AT THE STUDIO. PROPER AUTHENTIC! I DON'T KNOW HOW GUILTY I FEEL ABOUT IT BUT I LOVE AC/DC! PROPER NO NONSENSE ROCK AND ROLL! When did you start homebrewing? Any epic fails? STARTED ABOUT 4/5 YEARS AGO WHEN I ENTERED THE HOMEBREW CHALLENGE. IT WAS ALL PREP FOR WHAT BECAME THE VERY FIRST REV SUMMER ALE WITH THORNBRIDGE. FIRST HOMEBREW WAS AN EXCELLENT PALE ALE IF I REMEMBER RIGHTLY! POSSIBLY BEGINNER`S LUCK, BUT I'VE DONE A FEW NICE ONES. HOWEVER I ONCE TRIED TO DO A DUNKEL FOR SOME REASON WHICH DIDNT FERMENT PROPERLY AND ENDED UP AS A PRETTY SWEET, DARK GLOOP! How did the Thornbridge hook-up happen? I HAD A BIT OF DOWNTIME WITH THE BAND AROUND 2010 AND WENT TO WORK FOR THEM BEHIND THE BAR AT THE GREYSTONES PUB. LOVED IT. MET SIMON WEBSTER AND THEN WHEN THE BAND FIRED UP AGAIN HE APPROACHED ME ABOUT DOING A BEER COLLAB. I JUMPED AT THE CHANCE AND THE REST IS HISTORY! Fave pubs? Best Thornbridge pub? 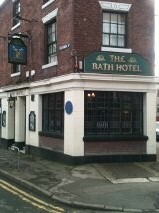 TO BE FAIR I LIKE MOST THORNBRIDGE PUBS, THOUGH I DO PARTICULARILY LIKE THE HALLAMSHIRE HOUSE AND ALSO THE BATH HOTEL. THE LATTER RETAINS THAT PROPER OLD PUB VIBE WHICH IS GREAT. I WAS A BIG FAN OF THE SHEAF VIEW AT HEELEY BACK IN THE DAY ALTHOUGH SINCE KIDS ARRIVED I HAVEN'T FOUND MYSELF OVER THERE MUCH OF LATE! THE MAIN MAN ALEX AT THE STAGS HEAD ON PSALTER LANE IS A JOLLY NICE CHAP AND IS ALWAYS INTERESTED IN WHAT I'M UP TO BEER WISE AND MUSICALLY, AND I CAN'T NOT MENTION JAMES AT THE COACH AND HORSES IN DRONFIELD. HE WAS BAR MANAGER AT DADA ON TRIPPET LANE BACK WHEN I USED TO RUN A FUNK AND SOUL NIGHT CALLED DEFUNKT. WE HAD A LAUGH! SHEFFIELD OBVS! MUNICH AS GOOD SECOND. AMAZING PLACE TO CONSUME BEER. 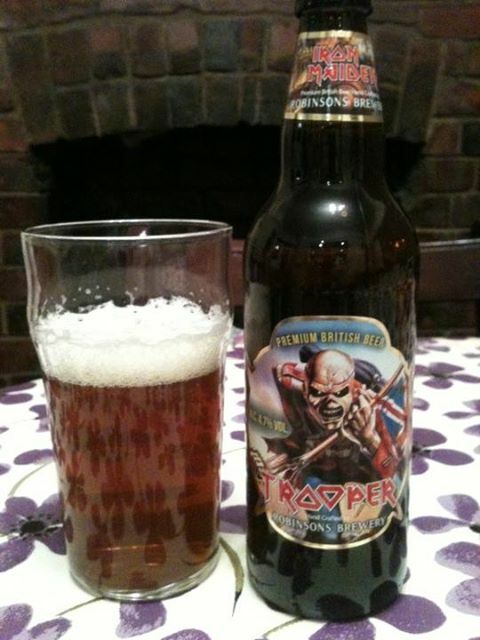 Any other bands big on the `craft` ale stuff? THERES DEFINITELY BEEN A FEW BANDS NOW WITH THEIR OWN BEER. IRON MAIDEN MAKE A RIGHT KILLING WITH THEIR TROOPER BEER, ALTHOUGH I CAN'T SAY I'M A FAN! THE QUESTION FOR ME WHEN I SEE BANDS RELEASING BEERS IS HOW MUCH INVOLVEMENT HAVE THEY HAD WITH IT? OR HAVE THEY JUST SLAPPED THEIR NAME ON IT? BIG UPS TO THOSE WHO DO GET THEIR HANDS DIRTY. MUCH AS IT PAINS ME TO SAY BUT WE'VE ALWAYS HAD AMAZING GIGS IN MANCHESTER. GLASGOW TOO. SHEFFIELD IS OK BUT THOSE HOMETOWN SHOWS ARE ALWAYS A BIT CRAZY AND I DON'T THINK YOU EVER PROPERLY ENJOY THEM IN THE SAME WAY. Any daft drinking stories / dodgy places you`ve supped? LOTS OF DAFT DRINKING STORIES, BUT PROBABLY NONE I CAN MENTION HERE. WE USED TO GET UP TO ALL SORTS AS YOUNG LADS OUT ON THE TOWN! DEFO BEEN IN A FEW DODGY PLACES, BACK BEFORE REVEREND DAYS I USED TO BE IN BANDS WITH MATES FROM SCHOOL AND WE USED TO GO AND PLAY IN ALL THE 'QUESTIONABLE' VILLAGE PUBS AROUND SHEFFIELD. IMAGINE ME AND MY PAL WALKING INTO A PROPER OLD MANS PUB WITH OUR GUITARS AND LONG HAIR AGED ABOUT 16. USED TO GET SOME RIGHT LOOKS AND SOME PRETTY GOOD HECKLES TOO! A FEW PINTS OF WARDS (RIP) WOULD SEE US THROUGH THOUGH! Best beer, Thornbridge and other? BEST THORNBRIDGE ALE HAS ALWAYS BEEN CHIRON FOR ME. ALTHOUGH RECENTLY I THOUGHT HUCK WAS EXCELLENT, AND GUTHRIE, ALTHOUGH I'M A BIT BIASED ON THAT ONE. I REALLY LOVE MAGIC ROCK GRAPEFRUIT HIREWIRE AND ALSO ELVIS JUICE BY BREWDOG IS GREAT. I'M INTO THOSE BIG HOPPED FRUITY ALES. TOP HOP, ITS A BIT OF AN OBVIOUS CHOICE BUT I THINK CASCADE IS JUST AMAZING AND HAS A LOT TO ANSWER FOR! GALAXY AND CITRA ARE PRETTY AWESOME TOO. Is the latest R&tM LP the best yet? I THINK SO! DIFFICULT TO BE SUBJECTIVE ABOUT THAT QUESTION BUT I THINK IN TERMS OF THE QUALITY AND CREATIVITY ITS DEFINITELY THE BEST. I FEEL LIKE WE ARE GETTING BETTER STILL WHICH IS A GOOD PLACE TO BE! AGEING NICELY LIKE A BARREL AGED STOUT! LOOKING FORWARD TO FINALLY GETTING IT OUT FOR PEOPLE TO HEAR!